Beijing: The Capital Of White Wagtails? The White Wagtail (Motacilla alba) is a familiar bird across Eurasia. Most authorities recognise 9 subspecies from the dark and distinctive Motacilla alba yarrelli in the western part of its range in the UK, to Motacilla alba lugens in Japan in the east. Breeding ranges of Motacilla alba races (1). Note that this map illustrates dukhunensis and persica, now considered to be part of M.a.alba. Growing up on the east coast of the UK, I was familiar with the yarrelli ssp, a common breeder, and was excited to see a few of the continental subspecies M.a.alba in early Spring, often associating with flocks of Yellow Wagtails (Motacilla flava). On arrival in Beijing I soon became familiar with the local breeder known as “Amur Wagtail”, ssp leucopsis, and saw ssp ocularis and ssp baicalensis on migration in spring and autumn. Amur Wagtail (Motacilla alba leucopsis), the most common race of White Wagtail in Beijing, and the only breeder. Motacilla alba ocularis, a common migrant in Spring and Autumn. Breeds in northern and eastern Siberia. Motacilla alba baicalensis. A scarce migrant in Beijing. Breeds in central Siberia. Note pale throat, compared with ‘eastern’ alba. In April 2012 I was lucky enough to find a “Masked Wagtail” (ssp personata) at Ma Chang, Wild Duck Lake, the first record of this subspecies in Beijing. And in winter 2013/2014 I saw my first “Black-backed Wagtail” (ssp lugens), a subspecies that breeds in Japan and is an annual, but scarce, winter visitor to the capital. M.a.personata at Ma Chang, Wild Duck Lake, Beijing, 14 April 2012. The first record of this subspecies for the capital. M.a.lugens (Black-backed Wagtail). A scarce winter visitor to Beijing. This one from Japan. Male ‘lugens’ White Wagtail, Miyun Reservoir, Beijing, 19 April 2015. Just last week, Shi Jin found a stunning, and Beijing’s second, “Masked Wagtail” (ssp personata) along the Wenyu River amongst a flock of 200+ White Wagtails. This find came a day after strong northwesterly winds that brought Beijing’s first dust storm of the Spring. It is probably no coincidence that, on Sunday, young local birder Luo Qingqing found the first record of eastern alba for the capital. In fact it seems that this latter sighting is not just a first for Beijing but for all of eastern China! An incredible record. 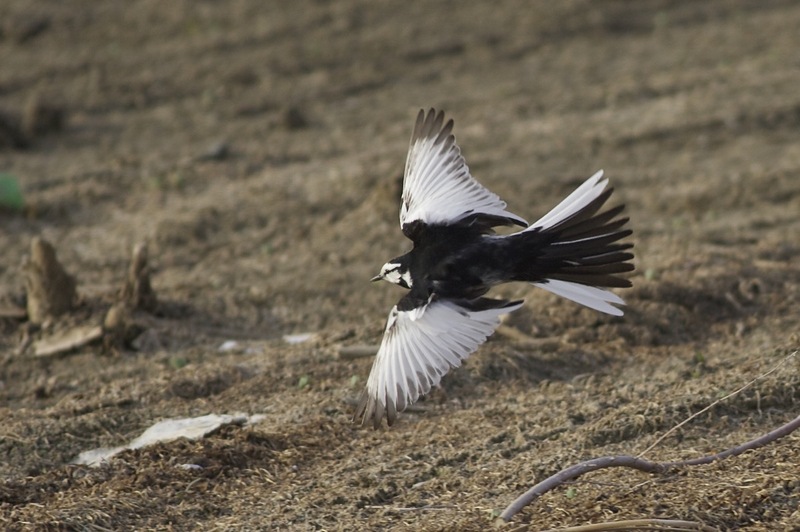 The second “Masked Wagtail” (M.a.personata) for Beijing, found by Shi Jin on the Wenyu River. The first record of M.a.alba in Beijing and, we think, eastern China. Photo by Luo Qingqing. ‘Eastern’ alba was formerly known as ssp dukhunensis but was subsumed into alba by Per Alström and Krister Mild in their excellent and groundbreaking “Pipits and Wagtails” book (2003). This treatment has been almost universally accepted and so dukhunensis no longer exists as a subspecies. ‘Eastern’ alba has been recorded in west China, in Xinjiang (where it is locally common) and is a regular but scarce migrant in Qinghai. It has also occurred in Ningxia and, possibly, Sichuan (Paul Holt, pers comm). Sunday’s sighting is the first that we are aware of in all of east China. Having already recorded lugens, leucopsis, ocularis and baicalensis, the sightings of personata and now alba bring the total number of subspecies seen in Beijing so far this year to 6! Is there anywhere in the world that can beat that? STOP PRESS: On Friday 3 April Shi Jin found a second, and Beijing’s third, personata along the Wenyu River. And, incredibly, on 6 April, local bird photographer Cheng Dong shot this image of Beijing’s 2nd alba White Wagtail at Ma Chang, Wild Duck Lake! White Wagtail ssp alba, Ma Chang 6 April 2015. The second record of this subspecies in Beijing just 8 days after the first! Photo by Cheng Dong. (1) L. Shyamal, based on; Nakamura, Kazue (1985). “Historical change of the geographical distribution of two closely related species of the genus Motacilla in the Japanese Archipelago: a preliminary note”. Bulletin of the Kanagawa prefecture Museum of Natural Science No.16. Posted on April 4, 2015 April 20, 2015 Categories UncategorizedTags Beijing, Luo Qingqing, Shi Jin, White Wagtail3 Comments on Beijing: The Capital Of White Wagtails?